Test Your Videogame Weapons Knowledge With a Quiz! How well do you know your iconic videogame implements of destruction? Some games can get by without the slightest bit of combat - nobody's shooting anything in Tetris - but if we're going to be honest here, we need to admit that yeah, most videogames involve punching, stabbing, or shooting someone in the face. There's nothing wrong with that; it's just how things are. But for every bad guy (or good guy) who is in dire need of a sound thrashing, there needs to be a cool and memorable implement to do it with. 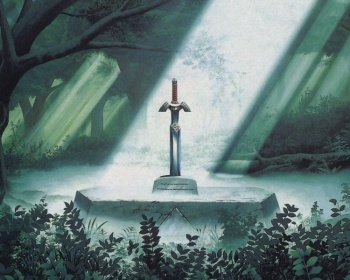 We know that Link is going to end up facing down the evil du jour with the Master Sword. We know that Mario is going to be shooting Koopa shells from his go-kart, and that Kratos is going to be chopping enemies into itty bitty enemy-bits with those freaky blades attached to his arms. We can probably guess that the main character of the next Doom is going to use a Big Freakin' Gun, if we're going out on a limb. This week's issue of The Escapist is all about weapons in games, and so we decided we'd throw in a very fitting quiz alongside it. Our Iconic Weapons quiz is a toughie, pulling from more than two decades of videogame history. You can take it as many times as you want if you get stumped, but remember that repeated tries will - as always - factor into your time on our leaderboards! Do you think you're ready? Then lock and load, draw your sword, and take our videogame weapons quiz here!